The array is infinitely long. 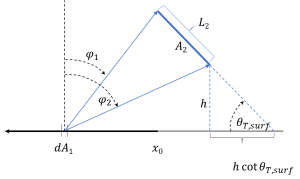 Irradiance on the ground is uniform and equal to , i.e., horizon blocking and near-field shading by the array is ignored. Irradiance reflects from the ground equally in all directions, i.e., the ground is a diffuse or Lambertian reflector. 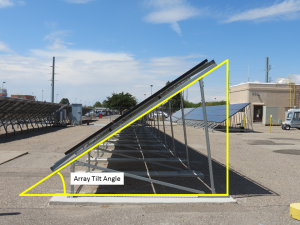 The ground is visible to the array from the point of intersection of the array’s slope projected to the ground, to the infinite horizon. With these assumptions the model for can be derived using a view or configuration factor. The view factor quantifies the fraction of diffuse reflected irradiance from one surface that impinges on a second surface .